Current Direction recognition is a Radiodetection technique for increasing the information available at difficult locates. 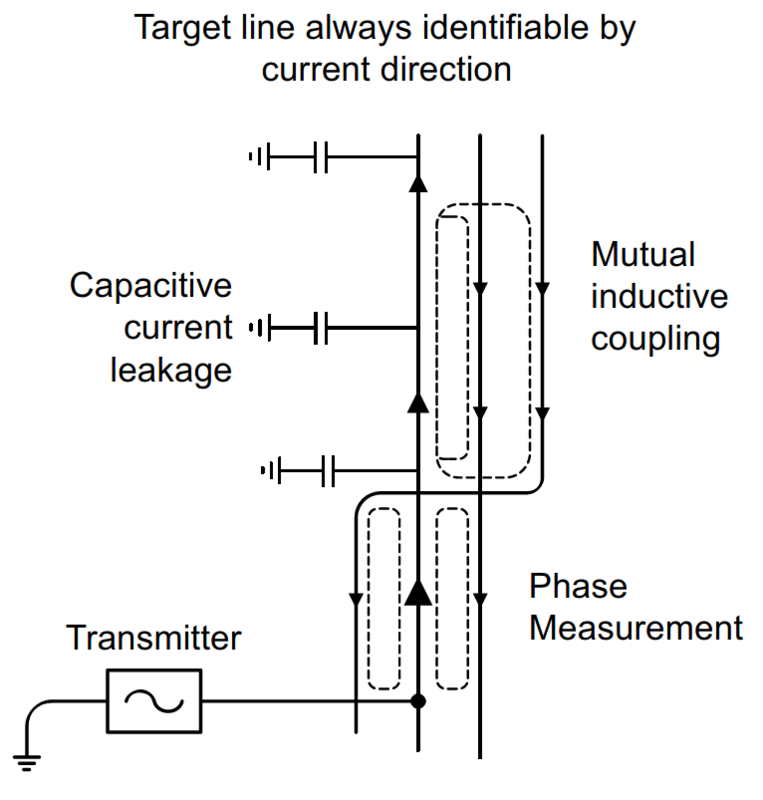 The Ac or DC signal article describes DC and AC current and explains why electromagnetic locators detect only AC signals. An alternating current does not have a direction. The electrons move backwards and forwards along the conductor and maintain the same average position. Despite this, many of the diagrams used in this, and other, Knowledge Base , show locator transmitters connected to conductors and use arrows to indicate a direction of current flow. The arrows actually show the direction of current flow at one instant in time; a few thousandths of a second later, the current may flow in the reverse direction. Nevertheless, these current flow direction arrows are useful; they indicate the behaviour of the applied current and allow us to use expressions such as ‘the current flows along the pipe and gradually leaks through the ground onto the adjacent cable’. 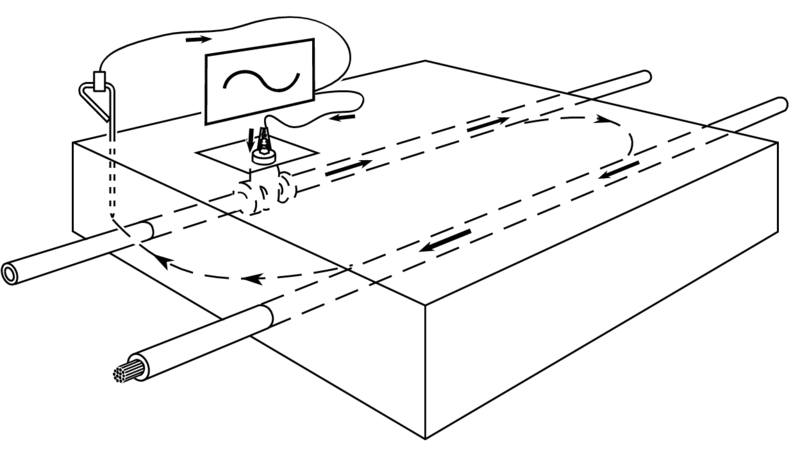 In the diagram the current appears to flow in one direction on the pipe and in the opposite direction on the cable. In practice, both signals are AC and appear identical to a locator. But suppose the locator could identify the current direction. It would then be capable of positively discriminating between the pipe and the cable. This is possible using Radiodetection’s Current Direction recognition technique in the Precision Locators. Quite simply, the display shows an arrow pointing either forwards or backwards to indicate the relative direction of current flow. As mentioned before, AC signals do not have a direction. But they do have a characteristic known as phase which is similar to direction. If an AC transmitter is connected to a pipe, it may cause a current to flow initially from South to North, then from North to South and so on. This can be represented on a graph which shows the direction (and magnitude) of current flow at different points in time. If a coil is held above the pipe, the induced voltage is proportional to the current flow and can be represented by an identical graph. What happens if the coil is then moved sideways to detect the return flow on the parallel connection cable? 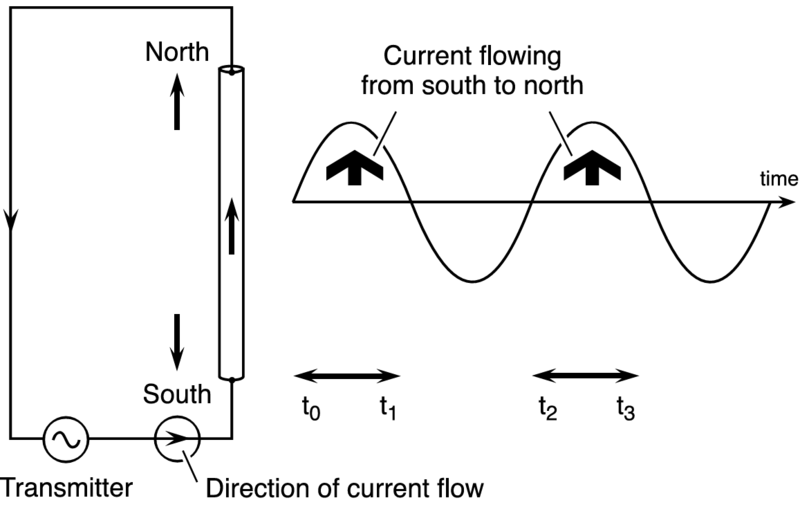 When the coil is at position B, the current it detects initially flows from North to South, then from South to North; exactly the opposite of the current flow detected at position A. 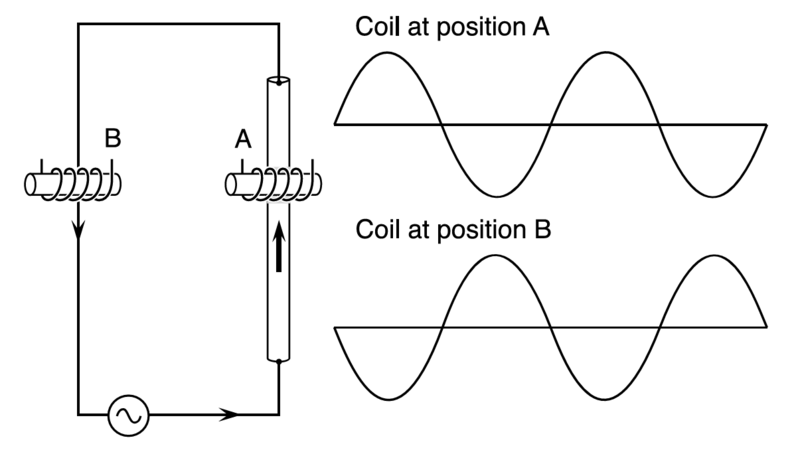 It follows that the signal induced in the search coil is also reversed - at any instant in time, the detected direction of current flow is reversed. The two graphs show that there is a detectable difference between “flow” and “return” AC currents and this can be used to determine the relative direction of flow. The special circuitry in Radiodetection’s CD receivers (and transmitters) is configured so that the receiver can be RESET to ‘remember’ the direction of current flow at one point so that any signal detected later can be compared with it. The RESET function enables the user to define in which direction the CD arrows will point. When reset the receiver will adjust the display to show the CD arrow pointing away from the user. This is defined as the direction of current flow. The convention normally adopted is that the current flows along the service away from the transmitter and returns on all adjacent services. This is achieved by resetting the receiver over the target line facing away from the transmitter. This works with both direct connection and current clamp injection. The only necessary rule for getting good information from a CD receiver is to be sure to use the RESET function at a position where you are confident that you understand in which ‘direction’ the current is flowing. Generally, this is easily achieved by always resetting close to the point where the transmitter is connected. 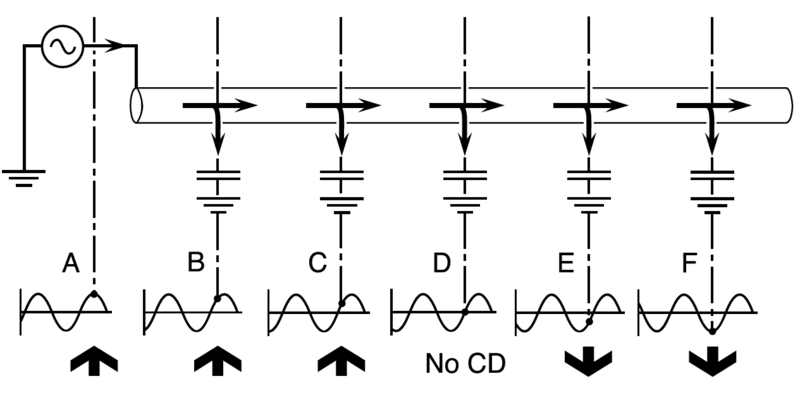 The CD technique works best at low signal frequencies and can be used with direct connection and current clamp injection methods. Section 12.3 suggests that a reversed AC signal can be considered to be flowing in the opposite direction. This is true but it can also be considered to be simply time-delayed. This diagram shows the same two graphs (waveforms) as before and illustrates that exactly the same current flow pattern is achieved if the signal is simply delayed for a period ‘t0’. 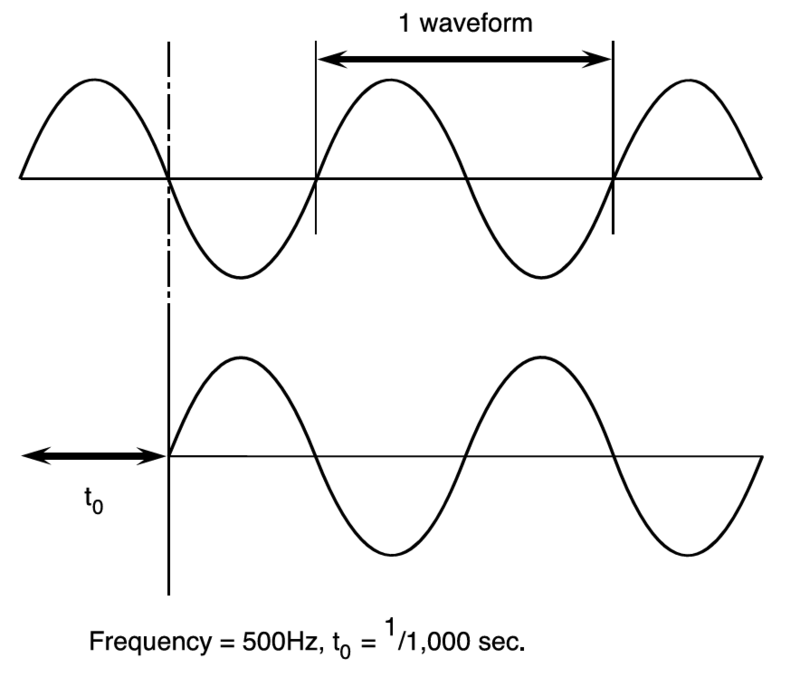 If the frequency is, for instance, 500Hz, the full waveform (positive and negative sections) is repeated 500 times a second. In this case, a time delay of 1/1000th of a second shifts the waveform forwards and causes it to appear to be upside-down. It therefore appears to be a signal flowing in the opposite direction. Time delays such as this are normally referred to as phase-shifts. A shift of phase can occur whenever an AC signal is flowing in a system of conductors which have a significant capacitance or inductance. It is the capacitance between an insulated line and ground that causes the gradual reduction of signal strength along a buried line. As signal gradually ‘leaks’ through a buried line’s capacitance, so the phase angle of the signal remaining on the line gradually changes. The effect is like a time delay but is not actually due to time delay - a 500Hz signal would have to travel a distance of some 300km (200 miles) to experience time delay equivalent to a reversal of phase (or direction). This is a diagram of a buried line with significant capacitance to ground. It illustrates the gradual phase-shift which occurs along the line. The diagram shows a reference point on each waveform. At first, the reference point occurs right on the peak of a positive half cycle (A). It gradually moves towards the zero crossing point (D) and ends up on the peak of a negative half cycle (F). In Radiodetection’s CD terms, the direction has shifted from forwards to backwards. At the intermediate point (D), the current flow is indeterminate. In this position the arrows flicker. In most cases, the loss of direction information does not occur until many km/miles from the transmitter. The situation is easily overcome by returning to the last point at which a CD reading was achieved (C) and operating RESET CD. This will have the effect of making the response at C equivalent to that at A. The ‘no CD’ message then does not occur until point F.